This afternoon the doorbell rang and there it was, sitting on the ramp to our front door–our very own copy of Disability Incarcerated! I had to wait my turn to read the chapter that Mark Friedman and I wrote our work helping People First of Tennessee and Speaking for Ourselves with their Closing Institutions Campaigns: Self-Advocacy: The Emancipation Movement Led by People With Intellectual and Developmental Disabilities. We felt honored to be asked to tell the story of the courage, vision and determination the leadership of those organizations demonstrated in the face of tremendous resistance and opposition. Mark and I drew from our personal archives and other primary sources to recount as much of the history of their efforts as we could. 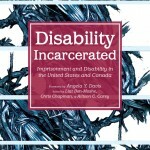 Copies of Disability Incarcerated are now available from Amazon as well as other online booksellers.